Lady Gaga sings a Bowie medley in tribute at the Grammy Awards (Video). Some were concerned that a full-on Lady Gaga tribute to the departed David Bowie might be disappointing. Gaga did her best to dispel those fears through sheer ferocious energy at Monday night’s Grammy Awards, running through nine Bowie songs in five minutes while strutting, snarling, and playing some kind of weird robot piano. It made for lively TV but a weird and ultimately disappointing tribute to Bowie’s career. 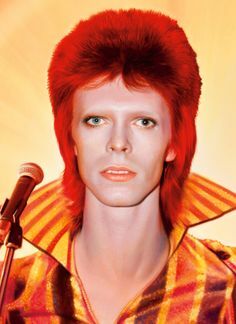 Gaga’s look was undeniably perfect, gloriously capturing Bowie’s Ziggy Stardust–era flash and glam. But starting with a careful video duet with Bowie himself on the opening of “Space Oddity,” Gaga’s tribute felt, mostly, like a kind of feverish drag medley, one in which the performer discovers as she goes along how ill-suited she is to the material. It turns out that the rock ’n’ roll persona Bowie adopted for many of his biggest hits—the ones that get played in tribute medleys—was a bad match for Gaga’s strengths. (Only on “Fashion” did she truly nail it.) Gaga’s occasionally fun gender- and genre-bending doesn’t truly compare to Bowie’s truly transgressive and riotously creative decades of self-reinvention. Even the presence of Nile Rodgers tearing it up on guitar couldn’t save the performance from feeling like it was working way too hard to achieve a shadow of the impact Bowie so effortlessly made.